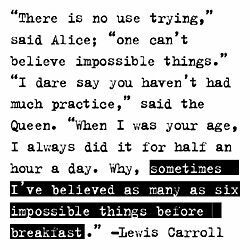 1/20: Believing Impossible Things Before Breakfast! What a way to start your day!! I have this quote on a magnet, hanging at eye level on my fridge. I’ve had it for many years now, and I still read it and grin pretty much every single day. Because this is how I live. I believe in miracles. I believe in impossible things. I believe in angels, and fairies, and the sleeping giant that lives under my land, and beneath my woods. I believe in truth, in living with integrity, in honor, in kindness. I believe in opening my heart, as painful as that can be. I believe in gnomes, and maybe even in unicorns, dragons, and leprechauns. I believe that energy gets tangled, and that it can be untangled. And that lives shift when that happens. I believe each body has a voice, and that we can connect with and learn from that voice. I believe in signs from spirit, from nature, from animals, from birds. I believe we can connect with people and pets who’ve crossed over. I believe that I can make a difference in the world, one person at a time. And I believe that every time someone shifts into their heart, into their flow, into their wholeness, because I’ve held space for the to do just that, that that shift, that Light, then ripples out into the world in ways I cannot even begin to imagine. Yep. I believe in impossible things, alright. Or rather, I should say, I believe everything and anything is possible. Try that on for size. I believe you can join me with this.